The Rebel Sweetheart. 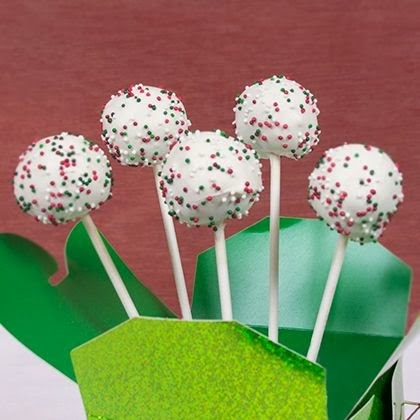 : Foodie Goodie | Holiday Sprinkle Cake Pops. Oh blog, I missed you! After my five-year-old laptop finally conked out on me, I was forced to go (back) in hiatus until I get a replacement. After several weeks of waiting and being excommunicated from the blogging world, my brand-spanking new Ideapad has found its way home and arrived at my doorstep today (thanks to my dear husband for this lovely present, and to my brother-in-law who was kind enough to bring it over, hehe)! And now I can finally say that I am so back, and I am back with a vengeance. Well, not exactly. Just tons of blog backlog that have piled up in my two-month absence. 1. Bake your cake according to the box instructions and set aside to cool completely. Prep your sprinkles by putting them into a small bowl or plate. 2. Crumble the cake finely into a bowl. 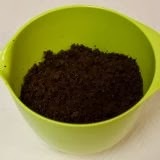 Discard any hard edging of the cake that does not crumble neatly. Spoon in ½ - ¾ the can of frosting and use your hands to mix the frosting thoroughly into the cake. 3. 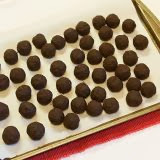 Using your hands, scoop out a small portion of cake and roll it into a ball and place on a parchment lined baking sheet. Once all the cake is shaped, place the cookie sheet into the freezer for 15 minutes. After that time, transfer to the refrigerator. 4. Once the 15 minutes is up, pour the white candy coating into a microwave safe bowl and microwave at 50% for 40-second intervals. Stir after each 40-second interval, being careful to not over heat the candy coating. When there are only a few lumps left, stir the coating until it is melted and smooth. 5. Remove 3 or 4 cakes from the refrigerator at a time to dip. Dip the end of a lollipop stick into the coating, then insert into the bottom of the cake. Now, dip the pop into the coating, submerging the cake completely. Do not swirl the cake pop or the cake will come apart into the bowl. Let any extra coating drip back into the bowl. 6. Before the candy coating dries, sprinkle red and green candy sprinkles all over the cake pop. Set the stick end into the Styrofoam to dry. Repeat until all the cake pops are dipped and decorated. Welcome back! these look yummy, and easy to make too.. thanks for sharing! I'm so glad I saw this! 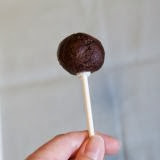 I was wondering if there was a way to make cake pops without using the cake pop molds they sell in stores. Cake pops are on my to-do list because they look like so much fun. I really like the presentation of yours in the box with the styrofoam. I hadn't seen that anywhere. YUMMY! And seems easy enough! Thanks for sharing!! Those loo so easy and yummy. Thanks for sharing. My daughter is all about baking. She's gonna love making these.